The Full Thigh Helix provides exceptional support to hamstrings and quadriceps through uniform compression treatment of the thigh. Reduced muscle oscillation and vibration during sporting activity may reduce injury and re-injury. Available in several colors. 100% Machine Washable. 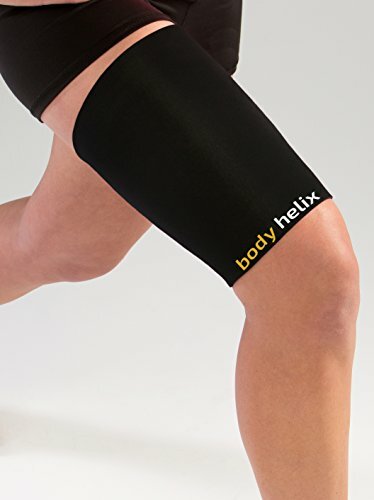 PROVIDES UNIFORM COMPRESSION: The Full Thigh Helix utilizes Body-Form Technology and provides uniform compression of the quadriceps and hamstring musculature while remaining anchored to the skin and staying firmly in place. The Helix will not slip or move. Additionally, it will not absorb excess water, bacteria, or odors. IDEAL FOR STRAINS AND SPRAINS: The Full Thigh Helix is 8.5 inches long and is ideal for injury management of thigh, groin and hamstring strains and sprains. Please note that if you are shorter than 5'9 inches you will want to consider the Thigh Helix. ENHANCED PERFORMANCE: Compression is shown to increase blood flow, which delays muscle fatigue and enhances overall athletic performance. WASH AND WEAR: The Full Thigh Helix is 100% machine washable. If you have any questions about this product by Bodyhelix, contact us by completing and submitting the form below. If you are looking for a specif part number, please include it with your message.